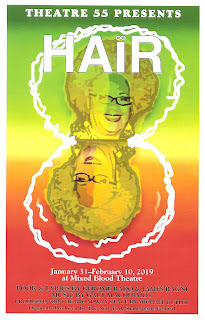 I was a little obsessed with the 40th anniversary revival of Hair, which opened on Broadway in 2009. I first fell in love with the show via a #TCTheater production directed by Michael Brindisi in 2004, and this fantastic Broadway revival only increased that love to the point of, yes, obsession. You can read more of my Hair thoughts here, but suffice it to say that when I adopted two adult male cats several years ago, I named them Claude and Berger. Now another 10 years have passed, so we're 50 years removed from the groundbreaking Gerome Ragni and James Rado creation (with music by Galt MacDermot) that changed the face of musical theater forever. Theatre 55, a new #TCTheater company dedicated to "enriching the lives of elders," has chosen Hair as their first production, populated with people who were alive and perhaps even saw that first production 50+ years ago, and lived the lifestyle of the '60s represented in the show. While the vocal performances are uneven in this cast made up mostly of non-professional actors, they capture the spirit of the piece in the way that perhaps younger people cannot. They bring an authenticity to the characters and situations of the show, and also a sort of fun free-wheeling vibe because they survived those tumultuous times (although one could say that the times we're living in now are pretty tumultuous too). The firehouse was packed with an audience full of people ready for this show and loving every minute of it. I'm quite sure that Ragni and Rado (the original Berger and Claude, the latter of whom is still alive and just turned 87) would be tickled with this production. Hair is light on plot, but you don't need a complicated plot to have a story to tell and a truth to convey. Hair is about a "tribe" of young people living, loving, and protesting war on the streets of NYC. We follow Claude's journey as he receives his draft notice in the mail and processes it with the help of his friends (and a drug-aided hallucination), and makes a decision that affects everyone's lives. * The musical was revolutionary when it premiered on Broadway in 1968, because it was the first time that what was happening on a Broadway stage reflected what was happening on the streets outside the theater. While trippy and fun and goofy, Hair also delves into issues of civil rights, women's rights, the sexual revolution, anti-war protests, experimentation with hallucinogenic drugs, and interracial relationships, at a time when those things were all boiling up together. Fifty years later, this production feels a little more nostalgic than urgent, but still pays homage to that time and those issues. 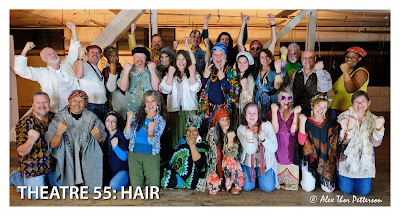 Under the direction of Theatre 55's founder Richard Hitchler, this 26-person tribe (as Hair casts are traditionally called) really feels like a group of loving friends, and are all "mostly over 50." Dancing and singing together, chatting and laughing in small groups on the sidelines, and all beautifully in the moment. Jeff Goodson is a wonderfully loopy Berger, best friend of our protagonist Claude whom everybody loves, the affable Brent Berheim. Other highlights include Rod Kleiss as the sweet and innocent Woof, Patty Lacy with a commanding voice and presence as Dionne, and Angela Walberg (I'm guessing the reason for the "mostly" qualifier in the age of the cast) bringing her lovely soprano voice to the role of Sheila. Theatre 55's three-fold vision is to: "Enrich the creative lives of elders as artists, audiences, and lifelong learners; Improve the health and well-being of seniors through theatre performance and education; and Enhance relationships by finding commonality and challenging stereotypes." Similar to Alive and Kickin' (aka "Seniors Rock!") but with fully staged productions rather than concerts, Theater 55 allows women and men of a certain age to be seen as the vital, vibrant, still relevant people they truly are. 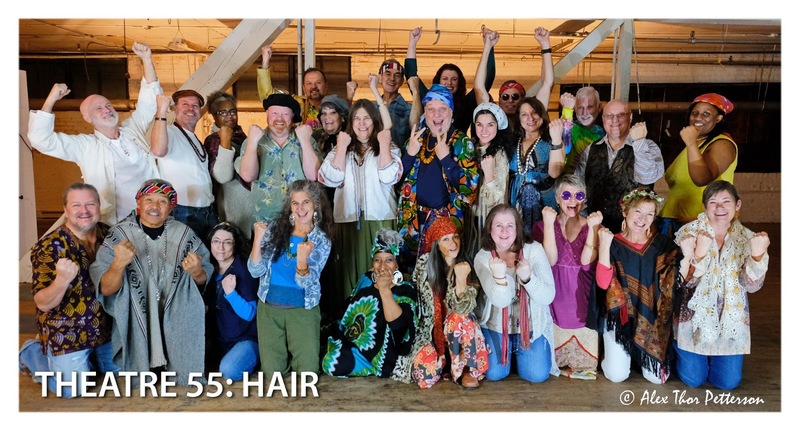 "Hair, performed by the people who lived it" continues through February 10 only, but there are a bunch of performances to choose from, including several matinees (those of us over 40 love our matinees!). Click here for info and to purchase $25 tickets. Be whoever you are, do whatever you want, just as long as you don't hurt anybody. *Plot summary, such as it is, borrowed from what I wrote about 7th House Theater Collective's production in 2013.